Deploying, maintaining and managing traditional X server-based applications can be costly and time-consuming. The high bandwidth requirements of client-side X servers dictate a LAN connection. With GO-Global’s near zero-footprint clients and high-speed RXP protocol, however, your organization saves time, money and scarce IT resources. 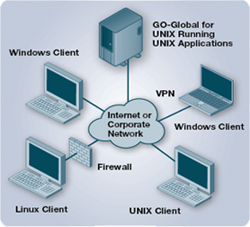 Using a Web browser plug-in or a tiny native client, you can instantly run your heavy-duty UNIX or Linux applications on any network-attached device, regardless of platform or operating system.